Explore a Wisconsin winter by way of cross-country skiing or snow shoeing, sledding or ice skating. Bundle up and prepare yourself for a memorable adventure. A winter wonderland awaits! Trek through Green Lake in a pair of snow shoes. Rent from us or bring your own! Depending on snow conditions, trails are open here at the resort, Green Lake Conference Center and Tuscumbia Country Club. Our rentals are $5 per hour. Years and years and years ago, a glacier was kind enough to leave us with some exciting sledding hills! 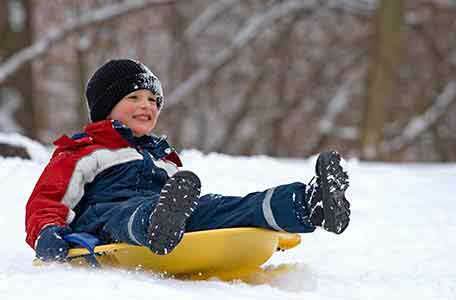 A popular sledding location is a short drive away at Zobel Park. For your convenience, Heidel House Resort offers complimentary sled rentals for guests. Ready for a new winter in Wisconsin experience? 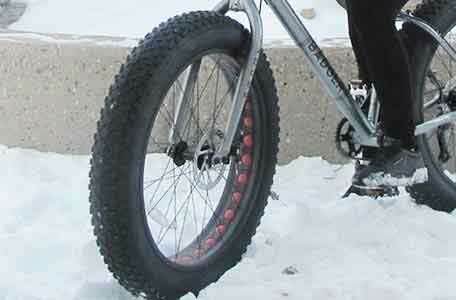 Our fat tire bikes are built to cruise through the snow and are a wonderful way to enjoy Green Lake’s winter wonderland. These new rentals are available for resort guests for $10 per hour. The Green Lake area abounds with Wisconsin cross-country ski trail options. If you don't have your skis, Heidel House Resort welcomes you to rent a pair from us for $10 per hour. Green Lake’s Sunnyside Conservancy, a protected natural area, is home to ski trails adjacent to Green Lake. For those who like to blaze their own trails, we suggest taking the short drive over to Green Lake Conference Center where you can bring your own skis or snowshoes and traverse through the woods and golf course. 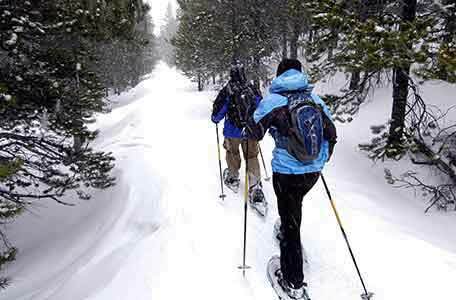 Those looking for a longer trail may find cross-country skiing bliss on the Red Pine Ski Trails of Mecan River Outfitters, offering 15 miles of groomed and tracked trails passing through red pines, hardwoods and marshland. This trail is for skiers of all experience levels. Rentals are available and trail fees are required. Enjoy ice skating on our lakeside rink! We even have a special lane for ice bowling if you want to try this fun winter activity. Skate rentals are available for resort guests and pins and a bowling ball are both complementary for resort guests to use. 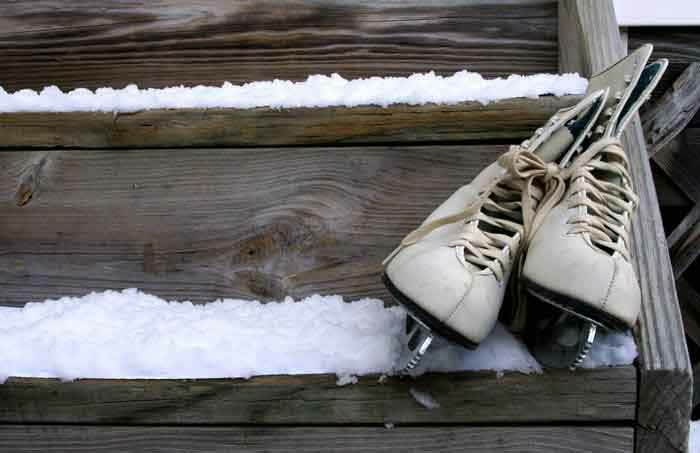 Ice skating is dependent on weather conditions. 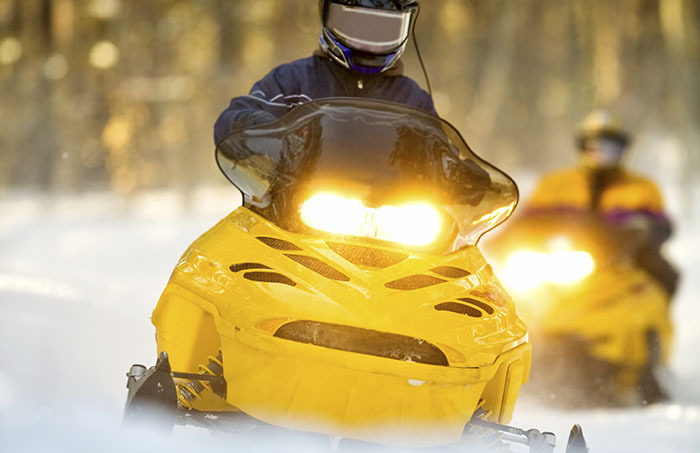 Snowmobile trails for Green Lake County are available at the Green Lake County Snowmobile Trails website. You can also call 920.294.3220 for a recorded message of the Green Lake County trails. Be safe and enjoy! What better way to enjoy a Wisconsin winter than with a classic Wisconsin hobby? In Green Lake, fish for lake trout, brown trout and cisco. You have multiple prime locations to choose from as a fisherman - There's Dartford Bay, Horner's Landing, the East end of Sunset Park, Dodge Memorial County Park and Hattie Sherwood Park. Mike Norton's Fishing & Hunting Adventures is a wonderful fishing guide service if you're looking for instruction. The Nortons have been guiding on Big Green Lake for four generations! With their service, fisherman will be provided shanties, bait and tackle and transportation. Contact Mike Norton's Fishing and Hunting for additional information.